Ather Sharif (center front) and his fellow SC15 Student Volunteers assemble for the traditional group photo. When Ather Sharif begins his Ph.D. work at the University of Washington in September, he can look back at his experience as a Student Volunteer at the SC13 and SC15 conferences as one of the drivers convincing him to enter the program. SC13, he returned as one of the Student Volunteers providing support for the conference organization and attendees. He was again a Student Volunteer at SC15. Helping broaden perspectives and increase inclusion is one of the goals of EvoXLabs, an organization founded by Sharif. 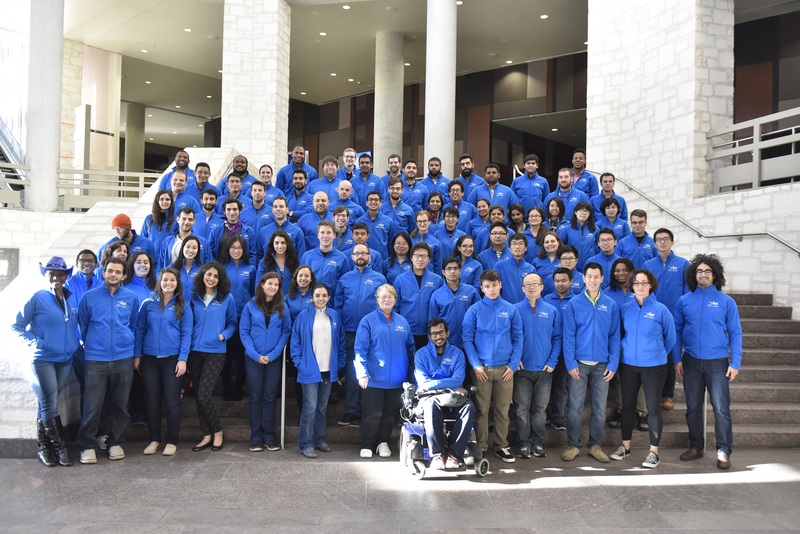 In late April, EvoXLabs organized The Accessible World, a two-day conference focused on making this world more accessible, followed by evoHaX, a 48-hour long hackathon to build accessible technologies for people with disabilities. Both events were held in Philadelphia as part of the annual Philly Tech Week celebration, which draws tens of thousands of participants to more than 100 events. Interested in being a Student Volunteer at SC16 to be held Nov. 13-18 in Salt Lake City? Learn more about the Student Volunteers program, part of the Students@SC program. This summer, Sharif will put his software engineering skills to work for Comcast, which is headquartered in Philadelphia and runs the largest technology hub on the east coast. He’ll be working on two large projects in cloud computing, an area he also learned about through talks and displays at SC conferences. It was networking at SC15 that convinced him to apply for a Ph.D. program, Sharif said. He met with Jeanine Cook, the SC15 Students@SC chair, to talk about options.